ABM is a worthy investment, according to 86% of marketers who say it boosts win rates. New research from TOPO also shows it enhances customer lifetime value (80%) and delivers higher ROI than a traditional go-to-market strategy (76%). 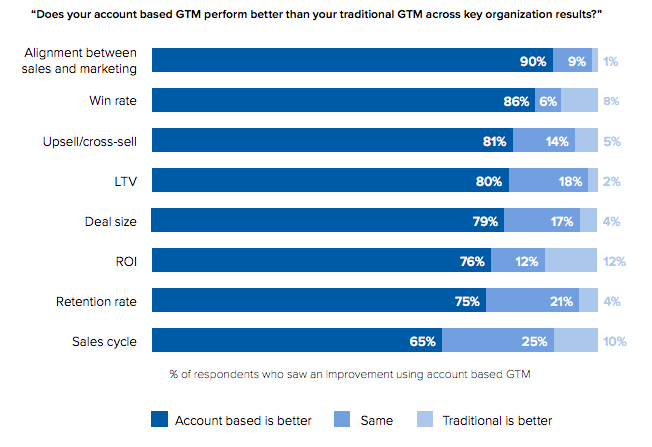 The Account Based Benchmark Report, which surveyed more than 150 industry practitioners, reveals that ABM budgets are growing and 42% plan to increase their ABM budgets by more than $75,000 in 2019. The top five ABM channels are SDR outreach (88%), events (72%), executive-to-executive outreach (70%), direct mail (67%) and digital advertising (64%).